The veterinary science team at Oklahoma State University says corrective surgery performed on a dog with upward paws was successful. Erik Clary, who is the associate professor of small animal surgery, said the 5-week-old hound named Milo basically had to “Army crawl” because his paws were turned upward instead of downward. 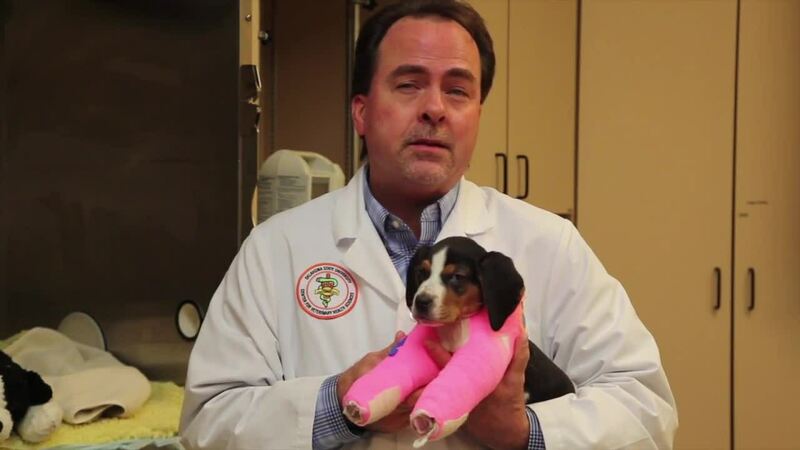 The surgery lasted 3 ½ hours, OSU’s Veterinary Medical Hospital said. Milo was surrendered to an animal rescue agency because of his condition. Clary said in 27 years of surgery, it is only the third time he has come across a dog with upward-facing paws. Milo now is in a rigid, front-body splint that he will wear about two more weeks before the pins are removed to make sure his elbows are stable. After that process, he will start intensive rehabilitation therapy. The animal rescue covered the cost of the surgery, OSU says, but if people want to help pay for Milo’s medical care, you can contact Oliver and Friends Farm Rescue and Sanctuary in Luther, Oklahoma, at 405-655-9885.